Systematic Review is a research method that aims to locate and summarize all available evidence for a specific question in order to guide decisions and practices (Definition from the Cochrane Handbook for Systematic Reviews of Interventions). It will help you gather knowledge about a particular field of study, identify recommendations for a future research, establish the context of a research topic or problem, and even identify the main methodologies and research techniques used in a particular research topic or field. 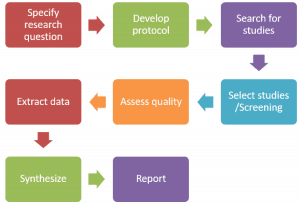 What we librarians can support you through your systematic review project? To get started, please complete the below request form or contact Marina Zhang at qianjin-zhang@uiowa.edu with questions. For example, what is your research question? How do you plan to disseminate the results of your project (manuscript publication, conference presentation, thesis or dissertation etc.)? In order to begin identifying search terms, it is important to view examples of articles that would meet inclusion criteria. Please paste in a few references.